The degraded down platform survives. 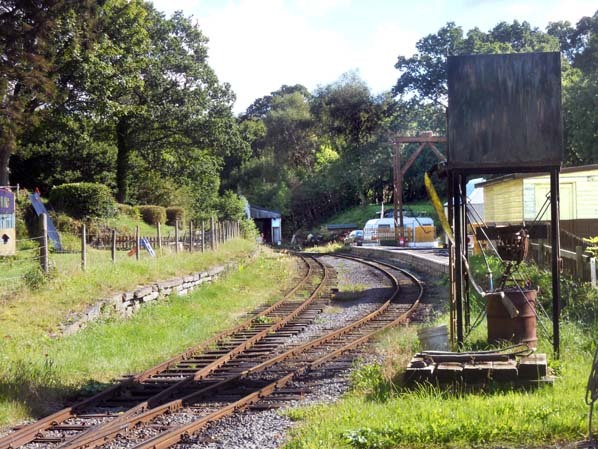 The up platform has been rebuilt and lowered for use by the Teifi Valley Railway. The only original building to survive is a two-storey warehouse and office for the local woollen mill which stands at the entrance to the goods yard opposite the cattle dock. Notes: Henllan village is entirely a product of the nineteenth and twentieth centuries. Its development may have followed the establishment of two woollen mills, at Cwerchyr in 1840, and Trebedw in 1885, but they always remained peripheral to the main textile centre around Drefach-Felindre. 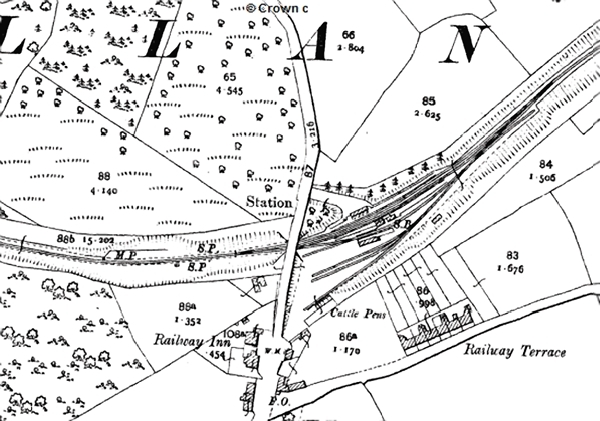 The construction of the railway line through the area, and a station at Henllan, clearly accelerated development, but it remained a relatively small village, comprising one street focused on the railway station. The settlement lies to the south of the Teifi Valley Railway amidst steep, attractive woodland areas in the Teifi Valley. In c.1940, a camp was established for Italian prisoners-of-war on the southern approach to the village; it consisted of rows of Nissen huts, most of which have now gone. The camp had largely become disused by 1944 and is now used for light industrial storage. Cwerchyr Mill closed in 1953, and Trebedw Mill in 1958. 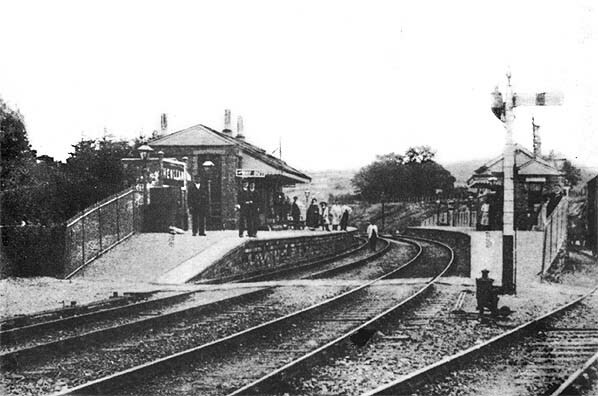 The station opened on 1 July 1895 as part of the Great Western Railway's extension of the former C&CR line from Llandyssil to Newcastle Emlyn. As built, the station had two curved facing platforms, with the main station building at the back of a forecourt serving the down platform. The brick building had a hipped slate roof and a narrow canopy and housed all of the passenger facilities including booking office, waiting rooms and toilets. A smaller brick-built waiting room, also with a narrow canopy, was provided on the up platform. Henllan signal box stood on the up platform at the north end of the waiting room. This controlled access to a moderate sized goods yard to the east of the station. The yard comprised a goods loop running behind the up platform, which served a wide loading dock. A short siding off the loop served a coal yard. A brick goods shed with a pitched slate roof and a canopy stood on the dock, with a small crane at the north end. At the back of the yard three further sidings fanned out, with the easternmost siding serving a cattle dock and pens close to the entrance to the goods yard. A 6-ton crane was sited on the east side of these sidings; this was one of the larger yard cranes on the line, matching the capacity of that at Newcastle Emlyn. As well as coal, timber and livestock, the yard handled considerable produce from the two local woollen mills and, at a later date, a two-storey wool warehouse and office with a curved corrugated iron roof, was built at the entrance to the goods yard, opposite the cattle dock. This is now the only original building on the site. After closure to goods traffic on 6 September 1965 the down loop line and sidings were quickly lifted, and all of the station and goods yard buildings (with the exception of the wool warehouse) were demolished by c1970. The line through the station remained in use until 1973 and was lifted in 1976.
up platform was rebuilt and lowered, and it reopened for passenger use in July 2009. 1906 1:2,500 OS map. 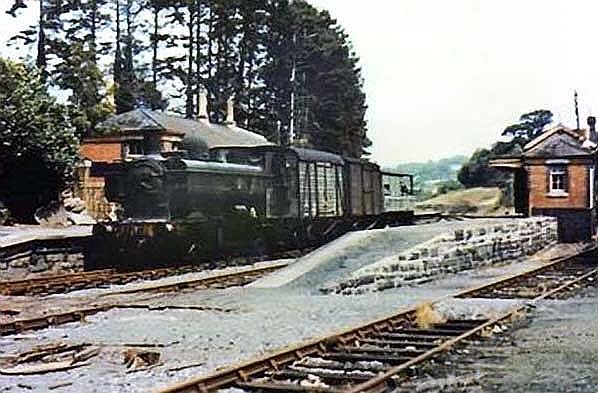 The development of the nineteenth century village of Henllan was accelerated following the arrival of the railway in 1895. A terrace of railway cottages is seen bottom right with the ‘Railway Inn’ opposite the entrance to the goods yard. The weighbridge (WM) appears to be outside the goods yard. The layout of the station remained largely unaltered throughout its life. 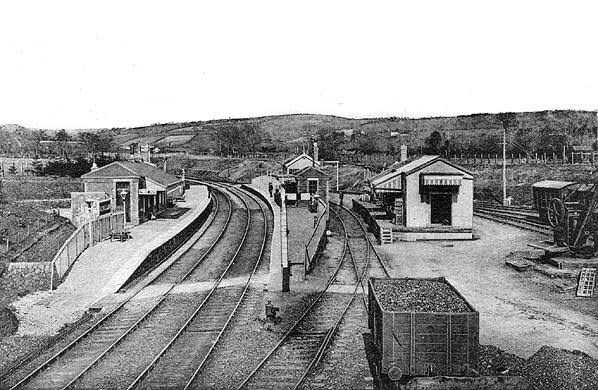 An early twentieth century view of Henllan station looking north-east. 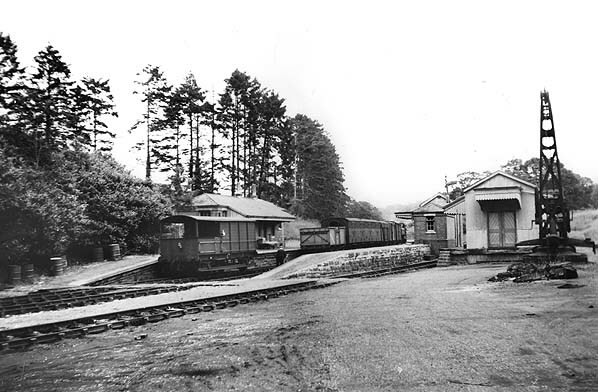 Henllan station looking north-east from the goods yard in July 1958. The short siding that served the original coal yard seen in the 1905 picture above. The substantial 6-ton yard crane is seen on the right. 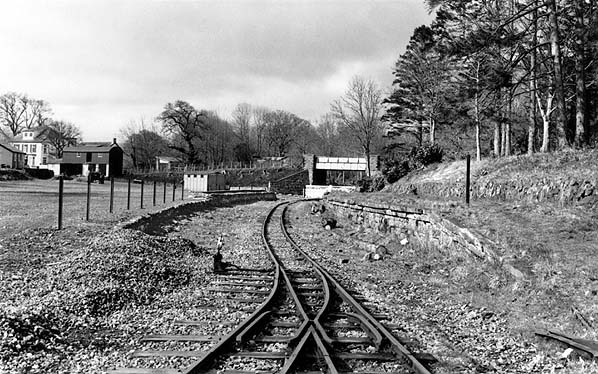 Henllan station looking north-east c. late 1950s. 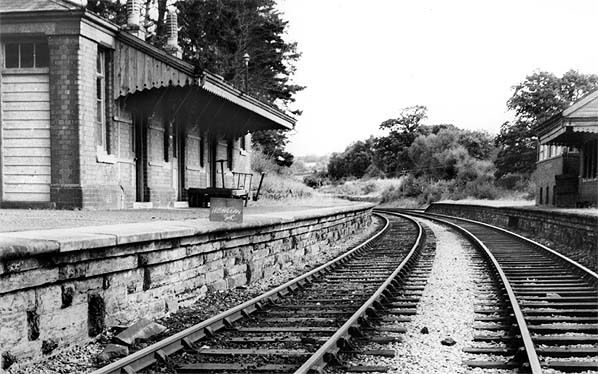 Henllan station looking south-west from the down platform c. late 1950s. The goods yard had two cranes, a large 6-ton crane out of view behind the goods shed and a smaller carne seen here on the goods dock. 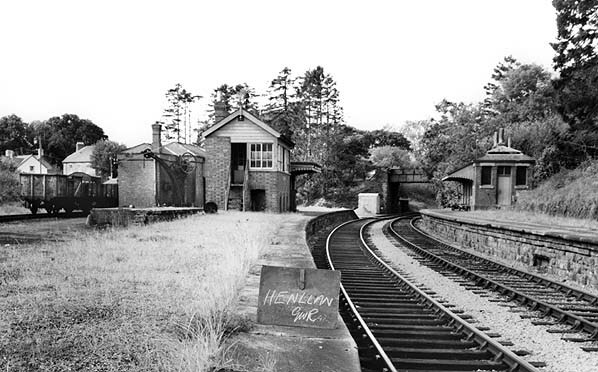 Henllan station looking north-east in August 1973. 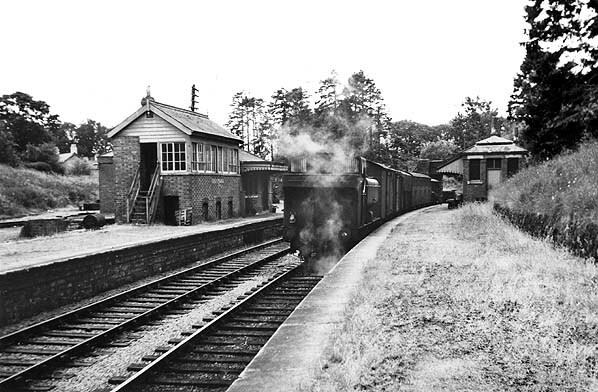 The down line was lifted shortly after the station closed to goods traffic in 1965 and the station buildings had all gone by c. 1970. 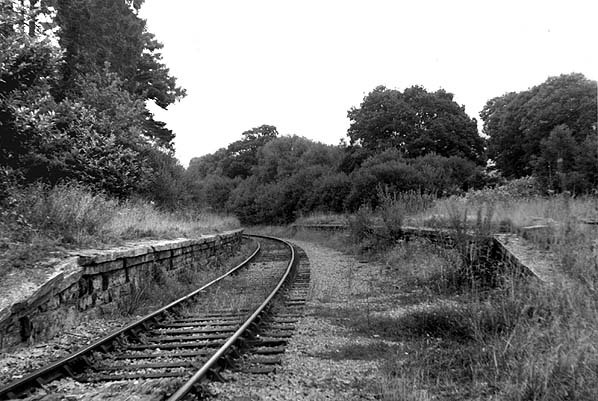 The line closed in September 1973 and the track was lifted in 1976. Henllan station looking south-west towards Newcastle Emlyn in April 1986. 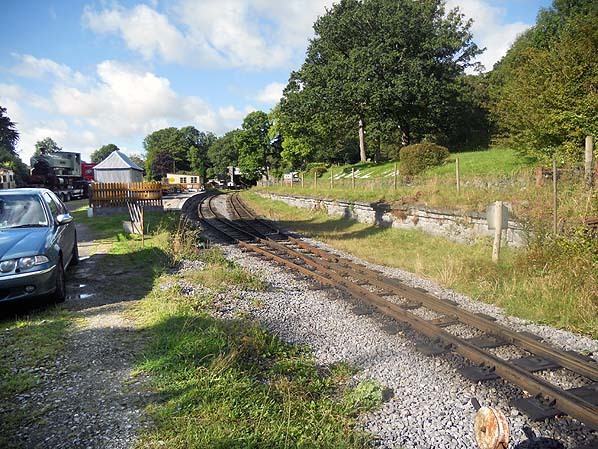 The Teifi Valley Railway laid their 2' gauge track into Henllan station in 1983 although this line led to their depot and was not used by passenger trains which terminated at their own station on the far side of the bridge. Passenger trains were eventually extended into the original station in July 2009. The original up platform has already been partially demolished and lowered. Looking north-east across the former Henllan goods yard in April 1986. Apart from the platforms nothing else survives in this view although the old wool warehouse is still standing behind the photographer. Henllan station looking south-west in September 2012. The Teifi Valley Railway now runs into the rebuilt up platform while the old down platform has been allowed to return to nature. Henllan station looking north-east in September 2012. 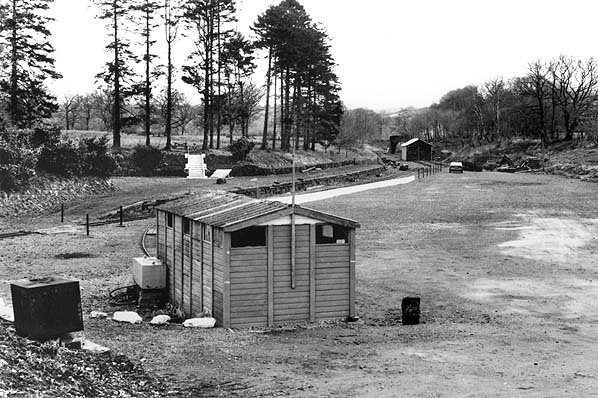 The Teifi Valley Railway depot and workshop is seen in the background.